Following a remark by friend and fellow-dyer Sue Craig that, if woad flowers gave a yellow colour, this could then be over-dyed with woad blue to give green, I felt moved to try this for myself. It seemed particularly useful for those years when one has a bumper crop of woad and would be unlikely to need the vast number of seeds the flowers would produce. My experiments showed that, sure enough, yellow woad flowers do indeed give yellow dyes, which can be over-dyed in a woad vat to give pretty greens. 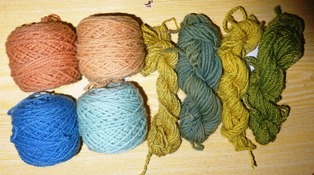 Following this method, unmordanted wool produces a sage green and wool mordanted in alum gives a grass green. To dye yellow with woad flowers, just use the usual simmering method and use at least 100% woad flowers for really rich colours. 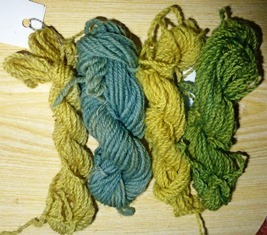 If you use both unmordanted and alum-mordanted wool, two different shades of green can be achieved, as described above. Once woad leaves have been used to make a woad vat, the same leaves can be used again to make a dye bath for pinks and tans. So when you make a woad vat for blues, don’t throw away the leaves but retain them to use again. Just simmer these used leaves for about 30 to 45 minutes to extract the pink-tan dye, strain off the dye liquid and add the fibres (unmordanted and/or alum-mordanted). Simmer for 30 to 45 minutes, leave to cool, then rinse and wash as usual. This means that it is possible to achieve blues from the woad vat, pinks and tan from the same woad leaves after they have been processed for blues for the woad vat, and greens from the yellows produced from the flowers and over-dyed in the woad vat. Oh, and I’m forgetting to mention the pinks and soft greens available from the woad seeds! 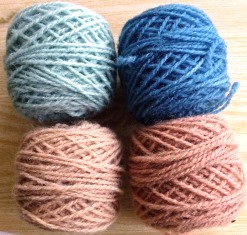 (See my latest book “A Heritage of Colour” for details and a photo of the colours from woad seeds.) Woad is indeed a remarkable dye plant!